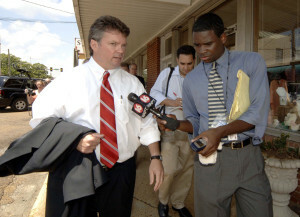 Echoing an earlier call by a U.S. senator, Democratic Mississippi Attorney General Jim Hood has requested an investigation into alleged car insurance “steering” and parts requirements, the Mississippi Business Journal reported Thursday. Repairer Driven News is attempting to obtain a copy of the letter. Hood also said non-direct repair program body shops had complained about being pressured to use State Farm’s PartsTrader service, according to the newspaper. “Body shops have reported to my office that they are pressured into accepting bid from Parts Trader for after-market or remanufactured part that are unsafe and far below the quality of the original equipment manufacturer,” Hood wrote, according to the Business Journal. The Business Journal said that Hood’s letter brings up the 1963 Consent Decree, also raised by U.S. Sen. Richard Blumenthal, D-Conn., in a letter dated Feb. 13. Blumenthal asked Holder to see if the agreement between the government and insurers still applies — particularly as it relates to complaints auto shops have today about insurers. “Consumers and auto repairers possibly remain victims of the very same misconduct insurers were directed to stop doing decades ago,” wrote Blumenthal, who along with Hood was featured in a controversial “Anderson Cooper 360″ report challenging insurers for allegedly mandating shoddy parts to save money. The steering issue was raised in Capitol Body Shop, Inc. et al v. State Farm Mutual Automobile Insurance Company et al, which had been dismissed with a chance to refile a more detailed lawsuit by today. The multiple shops in the case have requested the deadline be pushed back until March 30; Geico has challenged the extension, the only insurer to have done so. John Mosley, the owner of plaintiff Clinton Body Shop is running against Hood’s capital colleague Insurance Commissioner Mike Chaney in the Republican primary. Find out more about him here and in the Business Journal’s look at his campaign.